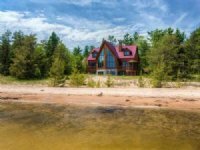 Beautiful Upper Michigan Log Cabin on a Private Lake. 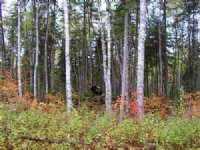 This 40-Acre wooded property is located on Perch Lake in Humboldt Township, in Marquette County of Michigan's Upper Peninsula. Once a bustling iron mining center of over 2,000 residents in the late 1800'S and early 1900'S, today there are only about 250 residents in the area. The first settlers were English iron miners from Cornwall and French woodsmen from Canada, who took jobs at the new Champion Mine. A wave of immigrants, led by the Scandinavians, Germans, Italians, Irish, and Finns arrived by 1900 and quickly established the nearby Village of Champion as a vital railroad, mining, logging, and farming center. 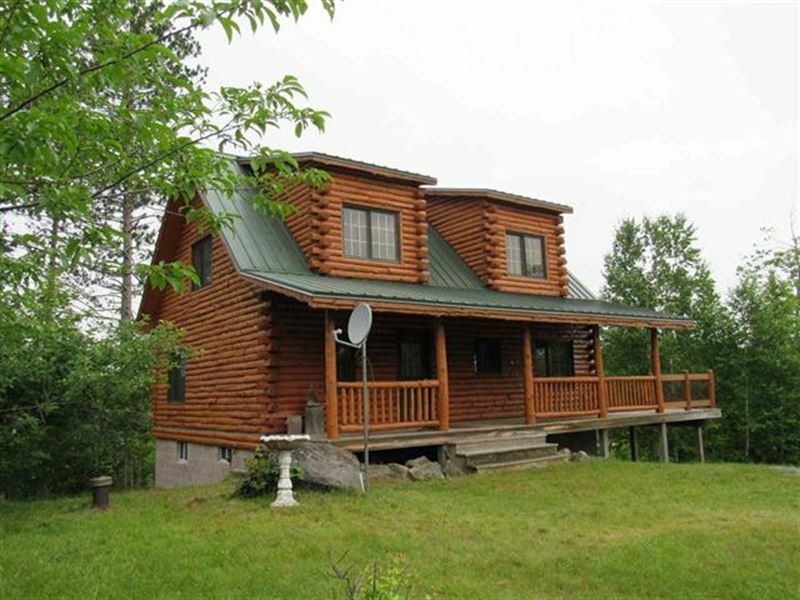 This cabin is located in an area known for Year-Round recreational opportunities. A few miles to the west is Lake Michigamme, the second largest lake in the U.P. With almost 100 miles of shoreline, 27 islands and over 4,300 acres of water, it is a popular fishing and boating destination. Canoes, kayaks, sailboats, fishing boats, pontoon boats, and personal watercraft are a common sight on the lake. This lake is known for walleye, muskie, and northern pike, and the DNR has introduced lake trout, splake, brook trout, and rainbow trout into the lake. 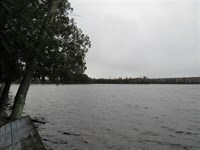 Van Riper State Park and Michigamme Shores Campground are on the shores of this lake. 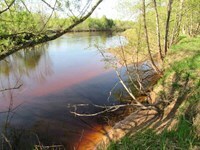 The Peshekee river flows into Lake Michigamme, and is a favorite of canoers and kayakers. The Michigamme River, which flows out of lake's south end, is becoming a favorite canoe and kayak destination. Remote Craig Lake State Park is located 15 miles further to the west. 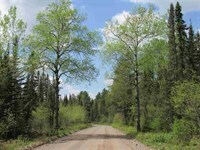 Hikers find developed hiking trails in Van Riper State Park, McCormick Wilderness, Craig Lake State Park, as well as the North Country Trail which passes through this area. 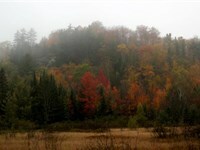 Check the Western Marquette County Mountain Biking web site for nearby mountain biking trails. As Summer rec sports end, attention turns to hunting. 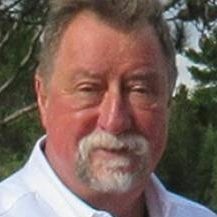 There are frequent Moose sightings, and abundant Whitetail deer, Black bear, Partridge (ruffed grouse), Woodcock, and Rabbits are found in nearby hunting lands. Snowmobiling is a popular winter sport. The main north-south Republic-Champion Multi-Use State Trail No. 5 is part of the access route to this property.. This trail meets up with the main east-west Peshekee-Clowry Multi-Use State Trail. 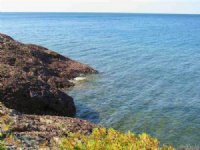 From these trails you can make connections throughout the U.P. There a few Perch Lakes in in Marquette County - this one has no public access, is about 40 Acres in size, and has good fishing for Bass and Panfish. 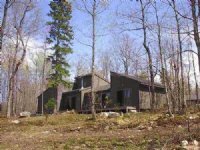 The beautiful 1,320 Square Foot log cabin was built in 2000, and sits on the high southern shore of the lake with a panoramic view. You enter the Cabin Foyer from a 7x32 Covered Front Porch, which wraps around the side of the cabin to another 8x24 Open Porch, which can also be used to access the building's Dining Area. An 11x14 Galley Style Kitchen is complete with an Lp gas refrigerator and 4-Burner stove-oven. The kitchen is open to the 8x11 Dining area and 11x17 Living Room. 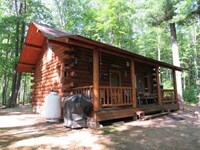 Sharing the main floor is an 11x13 Bedroom with beautiful views of the lake, and a 6x9 Bath. A log staircase takes you upstairs to a huge open loft made up of two wings that are 12x32 and 12x14 in size. The rooms are heated with a free-standing wood stove and an Lp Gas space heater, electricity is provided by a generator, and there is gas lighting and some battery powered lights. There is a drilled well and septic system. 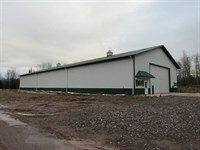 There is a full sized block Walk-out basement for plenty of storage. Outside is a very charming wood-fueled Sauna with 8x8 Changing Room, 8x8 Steam Room, and 8x16 Covered Porch. The grounds surrounding the buildings are well kept and feature six apple trees and one plum tree. The immediate landscape surrounding the lake is diverse and the woodlands consist of upland mixed forest. If you are seeking a modern log cabin in a very private setting you must see this one - Contact us today. High Suspension 4WD Drive Vehicle Recommended: From the L'Anse Welcome Sign take US-41 south 39+/- miles to County Road FD (near Timberjoy). Take a right and go.5 miles to a "Y" and stay right. Go.5 miles to a "T" and take a left. 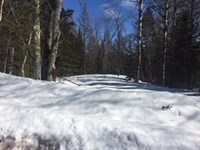 You will now be on the Snowmobile/ATV Trail Number 5. Go 1 mile to a locked Gate on the right. You will see Fire Number signs for 8470 and 8472. [It is another 1.4 miles to the cabin]. Open locked gate and go.2 miles to "Y" and stay right. Go.6 miles to "Y" and stay right. Go.6 miles to "Y" and take a left into the cabin site. 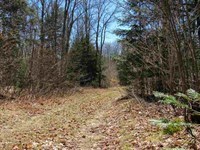 When calling broker, please say, "I found your listing 8470 Woods Rd / Trail 5, 1103158 on FARMFLIP."